Sometimes I wonder how much my palate would have been broadened without the blog. For sure, I sometimes pay more attention now to how food is presented. Not so much with the food styling as with the authenticity of the ingredients themselves. In the beginning, I often substituted one ingredient for another depending on availability and price, which isn't bad necessarily because that's how I often cooked. But with blogging, I try to remain true to the spirit of the dish, regardless of its origins. 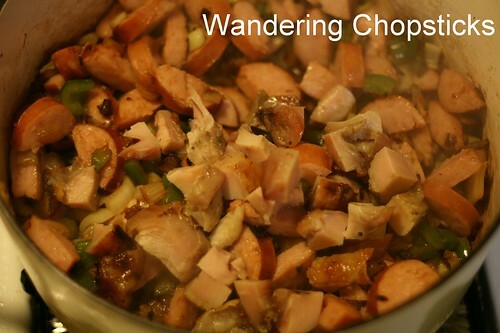 After all, certain dishes became famous because of the interplay of those very ingredients. 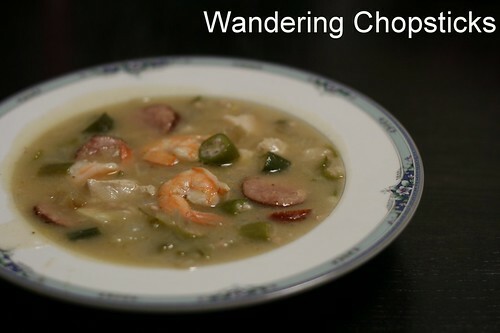 I had made gumbo several times before, but when I originally photographed it for the blog in 2008, celery was a ridiculous $1.99 apiece at the grocery store. So, I substituted with fennel stems I had saved from my Orange and Fennel Salad. It tasted fine, but the trinity of three in New Orleans cuisine -- onions, green bell peppers, and celery exist for a reason. 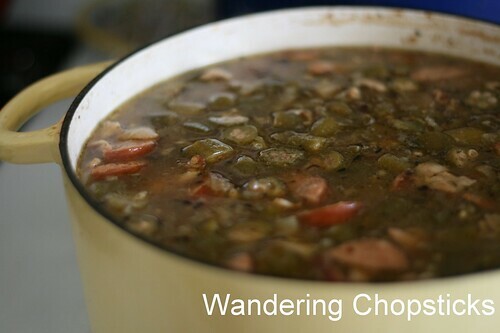 Of course, variations do exist and recipes often change, especially with regards to soups and stews. What's the difference between Creole and Cajun gumbos? Apparently Creole gumbo is more tomato-based and like a soup, with a roux made from butter and flour like they do in France. 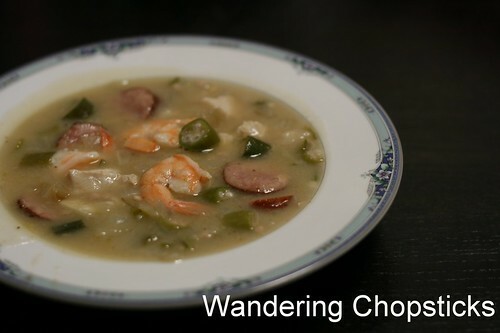 While Cajun gumbo with its more rustic origins requires a roux made with lard and flour, with readily available meats such as game, and file powder for thickening so it's more like a stew. I've made several other pots of gumbo since then, each time a little different depending on what's in my fridge and pantry. 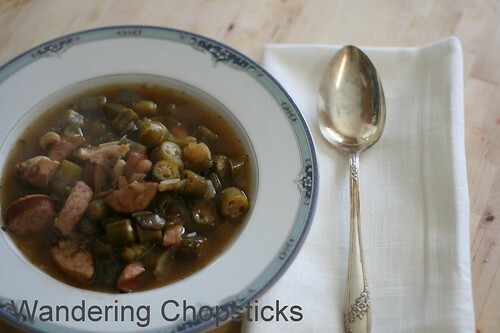 But there are some ingredients that I always include: the meats are often a combination of chicken, shrimp, and sausage; the trinity of onions, green bell peppers, and celery; and okra. 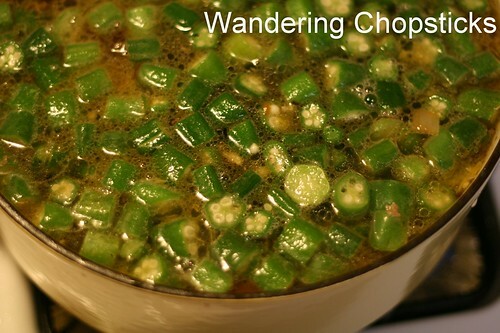 I love okra and often make gumbo just to give me an excuse to eat it. Sometimes I add tomatoes, but not always. 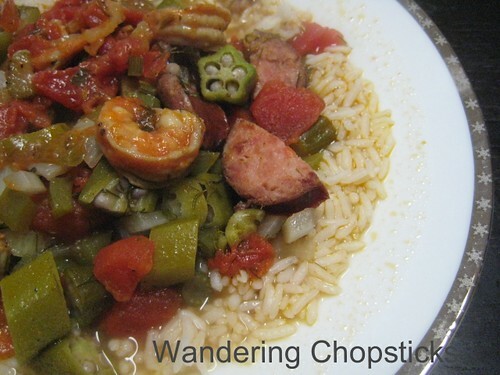 In any case, gumbo is easy enough to adapt to what you have in your kitchen. 1/2 lb shrimp, peeled and deveined. Save the shells for stock. Peel and devein the shrimp. Set aside the shrimp and save the shells. In a 5-quart stock pot, add 3 quarts of water to boil. 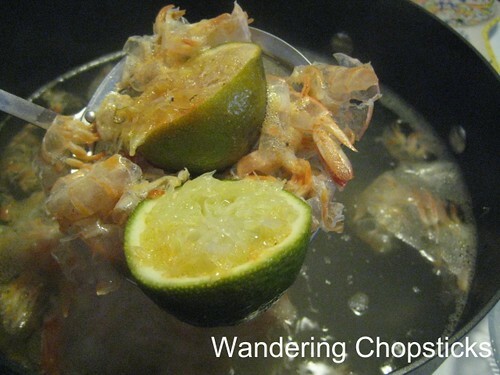 Add in the shrimp shells and the juice and rind of one lime or a small lemon. 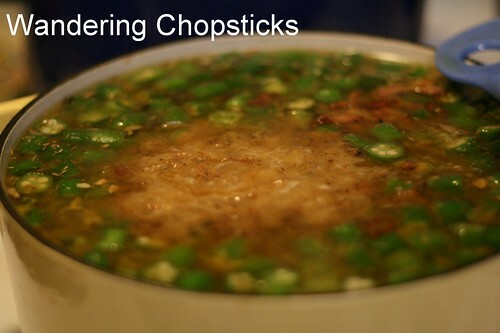 Let the stock simmer on medium-low while you prepare the rest of the gumbo. Dice one onion. 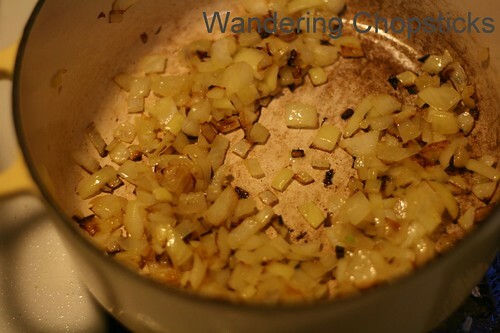 In another 5-quart stock pot, drizzle some olive oil and saute the onion until softened. While the onion is cooking, dice 1 green bell pepper and 2 stalks of celery. Add them to the pot when the onion has softened. Add 1 tsp salt, 1 tsp ground black pepper, and 2 tsps Old Bay Seasoning. While the vegetables are cooking, dice the smoked sausage and chicken and add them to the pot as well. Doesn't really matter what kind of chicken, this was lemongrass chicken leftover from my niece's first birthday party, but I've used raw chicken thigh and breast meat with no problems. 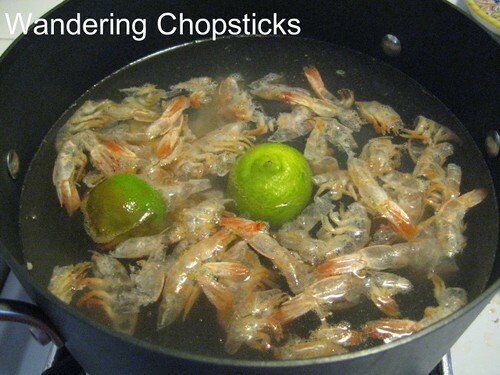 Scoop out the shrimp shells and lime from the stock pot. Then pour the quick shrimp stock into the pot with the meats and vegetables. Dice and add the okra. I usually use a bag of frozen, cut okra and that's always worked just fine. Dice and add 2 tomatoes if you'd like. Let the gumbo simmer at medium-low. Now, it's time to make the roux. 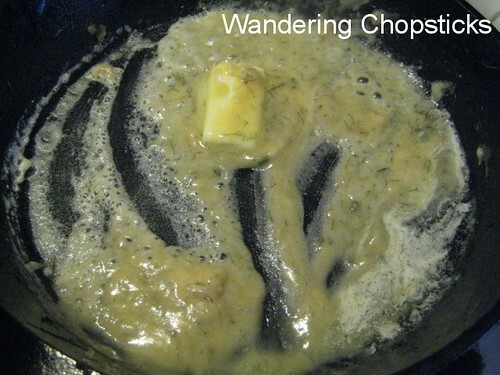 In another saucepan, or re-use the empty stock pot if you don't want to wash more pots, melt 2 tblsps butter. Add 2 tblsp flour and stir to combine evenly. In a few minutes, the roux will darken to a pale brown. Pour the roux into the pot of gumbo. 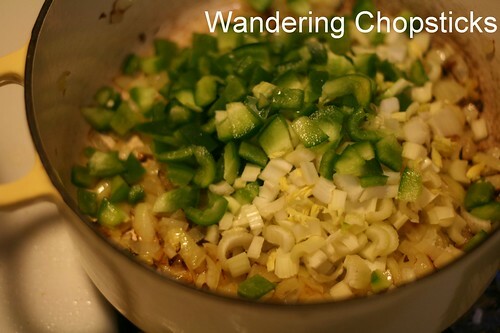 Stir to combine the roux into the gumbo and taste and adjust seasonings if necessary. Let simmer for another half hour to an hour, depending on how you like the thickness. Add the shrimp about 10 minutes before the gumbo is done so they don't get overcooked. More watery like a soup? Serve spooned over rice. This was the original 2008 photo that was OK, but obviously not as nicely done as the later versions. P.S. Wandering Chopsticks turned 6 this year! Can't believe I've been blogging for so long. 1 year ago today, five things I've learned from five years of blogging. 2 years ago today, Hong Kong-Style Macaroni Soup with Spam. 3 years ago today, McCormick & Schmick's Seafood Restaurant giveaway for my third year anniversary. 4 years ago today, terrible twos! 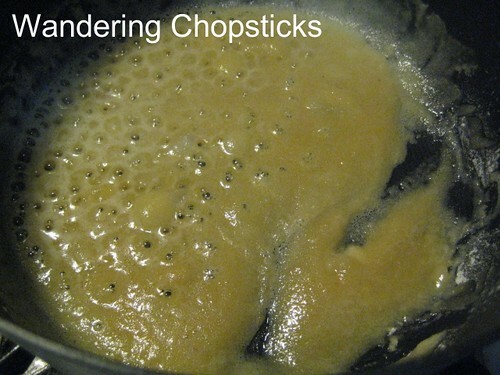 5 years ago today, Wandering Chopsticks turned 1 and I posted about how and why I started blogging. 6 years ago today, because I was too embarrassed to take out my camera, my sad little first post about Claro's Italian Market - Upland. This is now my third favorite blog post! This is about food I know well! 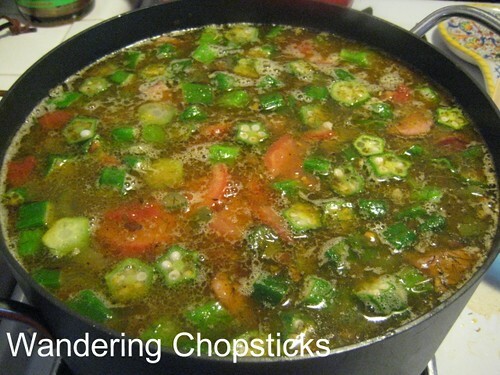 My shrimp okra gumbo is one of the few American dishes my mother on law will eat. She asked me to make one for Thanksgiving this year for her cousin that will be coming to visit. I know which is your favorite post, but what's #2? The jasmine rice one? I think it's the okra she likes since I like it too. Probably reminds her of canh chua. It is. 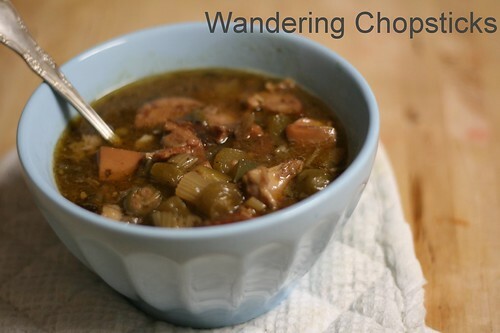 I like it pretty meaty and thick during winter and more soup-like during warmer months. YES!The jasmine rice post quite literally saved my rice sanity! Who would have thought a cajun girl could not cook rice.